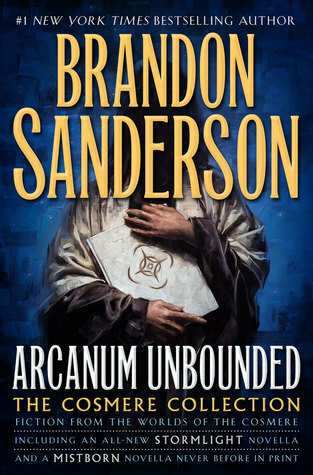 The Arcanum Unbounded includes 8 novellas and an excerpt of a graphic novel (White Sand), taking place on 6 different solar systems of the Cosmere ! This book is one of the most beautiful physical books I own and includes a beautiful star map as well as illustrations of a scene and of the planetary system of each story ! 😍 Khriss’ notes on the different planets and Sanderson’s postscripts are a fantastic bonus and give a whole new understanding of the stories and the Cosmere ! For more information about the Cosmere, the Shards, the different Realms… check this excellent post. I’ll include tiny-reviews (more like impressions) for the novellas but I want to note something important about Sanderson’s writing first and that just struck me because I was reading independent stories successively in Arcanum. With each new story, not only do we have a new world and set of characters. But also a new atmosphere and a new writing style. Sanderson deftly plays with tones, giving each of his new characters a voice, a way of talking but, most importantly, a distinctive way of thinking, acting and seeing the world. If you put Lift or Silence or Dusk or Kelsier in a given set and given course of events, you’ll end up with completely different stories with different perceptions et interpretation. My favorite ! This novella was set in the same world as Elantris and yet, Sanderson featured a new Empire, new characters and a new and very creative magic system! This is the story of 100 dire days in Shai’s life. Shai is a Forger, a heretic and a thief, but more importantly, she’s the only one capable of saving the Emperor’s life. You can check my full review here here and Luna’s review on the blog, here. 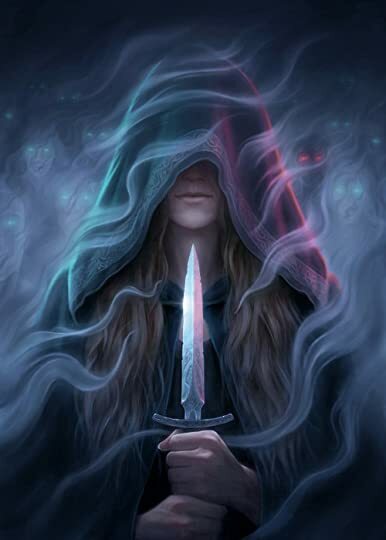 The Hope of Elantris takes place a few moments before the final climax in Elantris and tells the story of a young Elantrian that saved the city’s children. The story isn’t particularly innovative or substantial but it left me really nostalgic since Elantris is one of my favorite Sanderson’s books ! Ohh I loved reading this ! Especially because it featured Kelsier and gave a few details about his early training in Allomancy and the seeds of his revolution. Though the story didn’t add much to the Mistborn world, the Nostalgia factor alone made the read very exciting ! 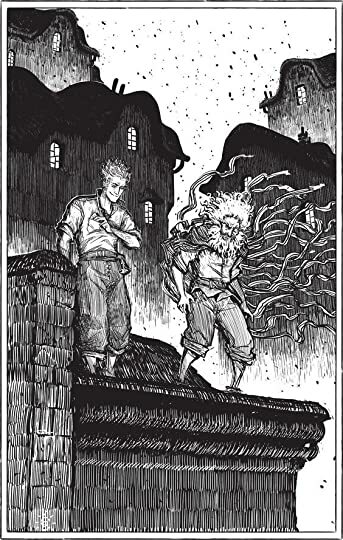 Illustration of Kelsier and Gemmel, included in the Arcanum Unbounded. I love to imagine that this town with its wavy rooftops was inspired by Gaudi’s architecture in Barcelona ! This is the story of one of Jak’s adventures (if you read Mistborn Era 2, you’d have noticed a few journal entries telling some of his stories). I can never state this enough: Jak is one of the worst and most vain and insufferable characters I’ve read about! I can’t believe I’m saying this but it was a torture to go through his “adventure” ! Luckily the funny footnotes were there (thus the additional star)… though they just made the main story look weak and pointless. I can’t tell anything without ruining the fun and surprises of this one !! 😉 This novella is full of secrets and revelations so you definitely should go into it blind (but only after reading Mistborn Eras 1 and 2!). If you’ve already read Secret History, you can check my review here here. Arcanum included an excerpt of White Sand (the graphic novel) as well as the original draft ! I’m not a fan of the graphic novel and found it a bit confusing since Sanderson’s magic systems are very intricate and are, in my opinion, better experienced in a classic narrative than in graphic form ! As for the story, I’m definitely intrigued ! This planet is peculiar and very interesting to explore and I would like to know more about young “padawan” Kenton’s journey and how he will compensate for his lack of magical skill ! This is probably the bleakest work and creepiest world written by Sanderson, up to this point! Set in a world half-eaten by a mysterious “Evil”, the story follows Silence Montane, a seemingly ordinary innkeeper who tries to protect her family and save her home while hiding her background and abilities. There is no magic system in this novella but there are “magical” beings (Shades) roaming the world and devouring those who break one of 3 simple rules : never kindle a flame, never shed another’s blood and never run in the dark. I loved Khriss’ explanation of the true nature of the Shades 😍 and Sanderson’s inspiration for the forbidden acts! You can check Luna’s full review of this novella here. Sixth of the Dusk made me travel far, far away ! Dusk is a trapper who chose the huge and inhospitable island of Patji (populated with magical birds, living plants, killing ants, and predators that hunt not by smell and sight, but by sensing their preys’ minds!) to make a living and who’s about to discover a huge threat to himself, to his way of living and more globally to his people’s culture and technology. This was a very captivating, though slow, story and I’m still not sure how it fits in the Cosmere (despite a mention of beings coming from other worlds), especially since there would probably not be a sequel (PS: read TS’ comment below for the interesting clarification). YES! I’m clearly on the unpopular opinions’ side right now so please don’t hate me, my fellow Sanderson’s lovers ! But I just can’t seem to like or care for Lift. AT ALL. I can’t tell much about the story because the novella is set after the closing events of Words of Radiance. But what I can say is that I had a lot of hope for Lift’s development and I didn’t get much. I understand that due to her background (I wish it was more developed in this story), she couldn’t develop much but only discover and accept herself. But I was just disappointed because despite all she learned and all she accomplished, she was still acting dumb, ignorant, carefree and silly. Those traits felt too forced to make her likable (to me). But there were enough references to the main series to make my heart beat faster and make me even more eager for the upcoming re-read in anticipation of Oathbringer. Special mention to the new city (amazing! ), Wyndle the spren (always whimpering and brave at the same time) and the humor ! Read between March and June, 2017. Thank you. I thought I was the only one not that much into ‘Edgedancer’. Just like you, I don’t care much about Lift..
Secret History was super unexpected for me ! I went into it completely blind and I was rewarded !